Portable TENS units and other portable electrotherapy units ship in carrying case with electrodes and instructions manual. 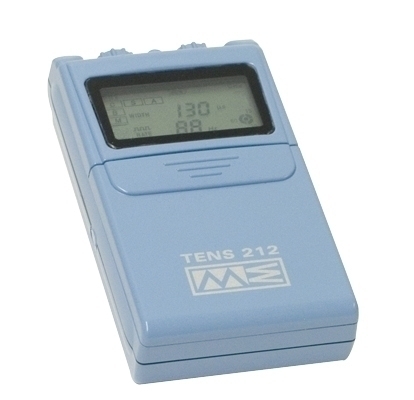 The TENS 212 is an affordable two-channel TENS unit that has continuous, modulated and burst modes. A digital display shows all treatment parameters while the unit is in use. Pulse frequency and width may be set independently. A compliance meter provides patient-use information in hours. The timer may be set for 15, 30, 60 minutes or continuous stimulation. Each unit comes with a carrying case and all supplies necessary for therapy. Dimensions: 4.25" x 1" x 2.4"
Notice: Typically ships in 1-2 days. This item can only be purchased by or on the order of a physician or other practitioner licensed to use or prescribe this device. Resellers must only sell to a buyer who meets these qualifications.